The area of the park had been fields and grazing land with a farm building accessed via the bridge over the canal along the Grendon Road. The extension of the Coventry Canal through Polesworth in 1790 and the development of steam power encouraged a steady growth in coal production in the area. By the 1840s, coal mining and other industries were firmly established in the village. Abbey Green Local Nature Reserve is situated within the larger Abbey Green Park along its northern boundary. A series of backwater channels connecting to the River Anker intersect the site. Abbey Green Park is one of four green spaces in North Warwickshire dedicated as Local Nature Reserves. The Wild:LIFE project involves local people in looking after nature on their doorstep. A habitat management plan has been produced by Warwickshire Wildlife Trust to help safeguard the habitats and species present. The Wild:LIFE project is funded by Access to Nature a scheme run by Natural England and Funded by the Big Lottery (2010 - 2013). Abbey Green Park was declared a Local Nature Reserve in North Warwickshire in 2013. The 62.5 hectare site, one third of which is a designated Site of Special Scientific Interest, contains several pools caused by mining subsidence, woodland habitats and is situated on the Coventry Canal. 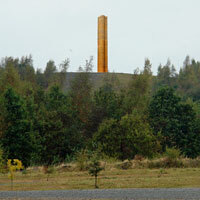 You can walk the path to the top of the 'pit mound' for a spectacular view for miles around and see up close the 'Golden Leaf' statue. There is a Tea Room and play area. Parasite in some dog poo potentially fatal to the farm animals grazing in those fields.